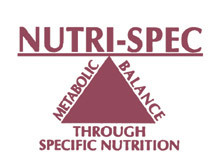 NUTRI-SPEC offers the nutrition-minded practitioner a diversity of methods to solve patients' nutrition problems quickly, easily, and profitably - NUTRI-SPEC Metabolic Balance Analysis, the NUTRI-SPEC Diphasic Nutrition Plan, and Doing FINE. 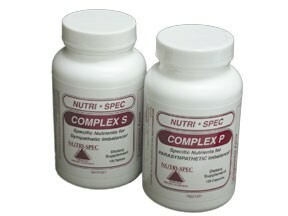 NUTRI-SPEC also supplies specifically formulated supplements to meet each patient's nutrition needs. The clinical effects of excess sympathetic or parasympathetic nerve activity are well known to chiropractors. Also, numerous studies indicate that a majority of patients will require support for sympathetic and/or parasympathetic balance issues at some point along the way to a stronger and longer life. 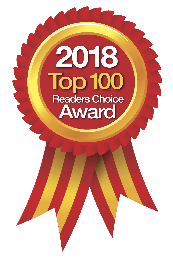 NUTRI-SPEC offers two highly specific nutrition supplements, COMPLEX S and COMPLEX P, that help correct sympathetic and parasympathetic imbalances. Additionally, the need for these supplements is easily determined by NUTRI-SPEC testing procedures. Do your patients suffer from blood sugar problems (hypoglycemia or diabetes), low energy, indigestion, ulcers, gall bladder or bowel problems, poor circulation, high or low blood pressure, nervous tension, insomnia, depression, immune system stress, allergies, or asthma? Is a patient "stuck" in a state of either sympathetic or parasympathetic over-reactivity? C testing provides you with an objective means of determining if your patientâ€™s symptoms are associated with a sympathetic or parasympathetic metabolic imbalance. As a highly beneficial adjunct to your chiropractic procedures, and in a single comprehensive supplement formula, COMPLEX S and COMPLEX P provide the needed adaptogens, amino acids, vitamins, minerals and trace minerals to help balance your sympathetic and parasympathetic patients.